My bread tastes sweeter when the street is clean like a table were the words of immigrant Mario Ezzo who lived in Aliquippa, Pennsylvania during the Great Depression. Like many, Mario was living on public assistance. He became a folk hero by sweeping the main street of Aliquippa everyday, saying it was the least he could do in return for the government check he was receiving. 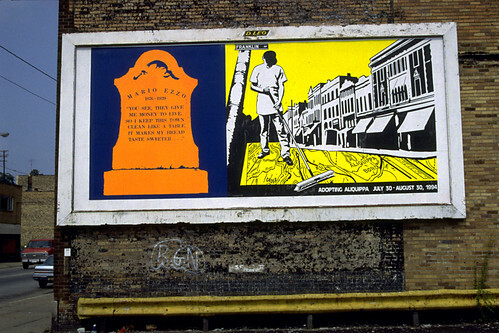 Co-authored with Lisa Link, this billboard was installed for a community arts festival in Aliquippa, and subsequently published in Lucy Lippard‘s book, Lure of the Local- senses of place in a multicentered society. The local Beaver newspaper covered the project as well. is indeed more blessed to earned it… real life.